The Harper’s Weekly cartoonist and Tribune editor continued as allies in the Republican camp during the 1868 presidential campaign, backing General Ulysses S. Grant against his Democratic rival, Horatio Seymour, the former governor of New York. Shortly before the November election, Nast arrayed Grant’s Republican forces—“The Boys in Blue”—facing Seymour’s Democratic troops—“The Boys in Grey.” It was a confrontation obviously intended to remind readers of the Civil War contest between Union and Confederate troops. 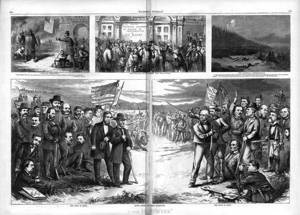 On the left, in the Republican-Union half of “Both Sides of the Question,” Greeley appears holding the New York Tribune just behind Schuyler Colfax, the Republican vice-presidential nominee (who stands behind Grant). Nast is shown in the lower-left corner sharpening his pencil.